Jaayden Lafontant and her support staff enjoyed Signing Day when she inked her spot at Concordia University. 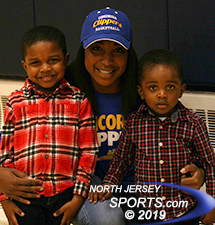 SADDLE RIVER – Jaayden Lafontant always dreamed about being a collegiate basketball player from the time she first picked up a basketball. It appeared that was an easier layup than any that Lafontant ever took in game action after a stellar sophomore season. However, injuries put a crimp in her plans. Just after recovering from a first ACL tear she suffered another ACL injury that forced her to miss her entire junior season, the most important in terms of recruiting. All of a sudden, coaches that were once keeping in contact fell off the grid and Lafontant wondered if this was it for her basketball career. That thought was brief as Lafontant came all the way back once again to be an impact player for the No. 2 team in New Jersey this season. Earlier this week her dream was realized as Lafontant signed to play for Division 2 Concordia University in New York. There was a buzz about the defensive/rebounding whiz and she made quite an impact during her first game in a Saddle River Day uniform after returning from missing her entire freshman season and most of her sophomore campaign recovering from a torn ACL. She was a game-changer to help the Rebels win a second straight Bergen County Tournament title and averaged 14.5 rebounds per game during their four state tournament games that season. With lots of colleges vying for her services after high school, it looked a cinch that her dream would be realized. She felt all the way from her back from her injury only to hear that horrific pop sound again in a preseason scrimmage during her junior year. Driving to the basket she was fouled. As she came down and hit the floor she knew immediately. First there was the grieving process, then the recovery process of the same grueling exercises she was doing just two years ago. Initially, she focused on the facts that it is significantly harder to recover from a second ACL tear. But then a switch went on and her focus immediately shifted to defying those odds. By turning a detriment into a strength, Lafontant knew that her basketball and her best self personally was still ahead of her, not behind her. With each small step towards getting back on the court, the senior guard saw the light at the end of the tunnel. All she could hope for was a chance to get back on the court and show a coaching staff to see that while once a prized recruit that Lafontant was now a diamond in the rough that could still be an asset to any program. Concordia University had that belief and never lost touch through all of it. Already having contact with the coaches, once she stepped on the campus she knew right then that it was the place she was meant to be. With her high school graduation from Saddle River Day on the horizon, Lafontant looks forward to what the next chapter of her life has in store.